Ultra HD 4K TVs are being touted as the next big thing, but it's a resolution revolution that's going to be largely fought not in Europe or the North America, but in China. Chinese brand Seiki is selling a 39-inch 4K TV for a mere £295 (US$499, AU$535) and a 50-inch for just £474 (US$799.96, about AU$816) on Tiger Direct. Another 50-incher from Chinese company TCL costs just £592 (US$999, about AU$1075). The cheapest 4K TV we could find in the UK – Samsung's 40-inch UE40HU6900 – costs £999 (about US$1697, AU$1815) on pre-order, though it's not trailed on Samsung's UK website. It's also true that 4K TV in the UK tends to begin at the 48-inch size, which does open-up the market for anyone selling smaller sizes at much cheaper prices. Could the likes of Seiki and TCL take a big chunk of business away from the entrenched Korean and Japanese brands like Samsung, LG, Sony, Panasonic and Toshiba? The so-called 'Tier 1' brands might have a firm grip on electrical retailers in the UK and US, but it's a very different story in China. There's a clear trend in China to sticking to domestic brands, with Changhong, Haier, HiSense, Konka, Skyworth and TCL in the driving seat. They're locked in battle to produce not the best-looking, best performing, most curved or biggest 4K TVs, but the absolute cheapest possible. It wasn't supposed to be this way. According to NPD DisplaySearch, Sony took a whopping 23% of the global market for 4K TVs in 2013, with other big brands in hot pursuit. "Alongside Sony, Samsung has also taken an early lead in the 4K market," says William Pratt, Research Analyst at Futuresource Consulting. But it won't last. Last year only around 1.5 million such sets were sold – a fraction of the 225 million TVs sold around the world – but in 2014, 12 million will be sold. So 4K is on a steep upwards curve; Futuresource Consulting forecasts that Ultra HD 4K sets will account for 5% of the global TV market this year, rising to a whopping 42% by 2018. In short, 4K TV is set for mass adoption, but while Samsung and LG are attempting to out-do Sony, it's the challenge from the likes of TCL, Hisense and Skyworth that should most concern them all. The little-known Chinese manufacturers are trying to undercut the bigger global brands – and with a Chinese 4K TV costing less than half what they do in the West, they could well succeed. For now they're restricted to the domestic market, but there's no reason why that can't change. It won't be just Chinese brands; another brand from Asia-Pacific, Kogan, also has plans to unleash cheap 4K TVs. 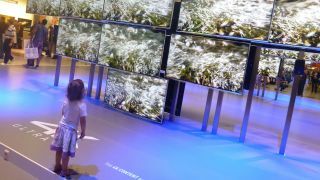 "The real focus for UHD TV makers in 2014 will be cost reduction," says Jusy Hong, senior analyst for consumer electronics and technology at analyst firm IHS. "Lower pricing will enable the market to expand, but UHD sets still have a long way to go before they command a major share of the overall market." Ironically it could be faltering demand in China that drives the country's brands abroad. "The global TV market continues to be in transition following a golden period of tremendous growth from 2009 to 2011," says Hong. "Television shipments were down again in 2013 just like in 2012, but an unusual development was the slow market last year in China, Asia-Pacific and Eastern Europe – until recently among the brighter spots for the industry." That fall in China is down to the ending of a government subsidy program, though the cutting of CRT (remember them?) production is fuelling demand for cheaper and cheaper LCD TVs. With the World Cup coming up, Chinese manufacturers have been turning to cheap LCD panels – including 4K – sourced from Taiwan, and they're looking to expand to make up the shortfall. "China's domestic brands continue to push into international markets and we anticipate this expansion to become more rapid as the Chinese domestic market declines," says Pratt. The hunt for higher margins by all brands everywhere will likely mean that all large screen sizes – probably from 39-inch upwards – will have 4K resolutions as standard within a year or so. More efficient 4K panel manufacturing will lead to even lower prices, though we're not talking about the epitome of TV production. Instead, expect the mass-market to be flooded with 4K sets that are low on contrast and brightness, tight on colour, and have the kind of 50Hz refresh rate that the UK market has more or less moved on from. Despite questionable quality, the price pressure from China could be too much. Could we see Tier 1 brands exit the 4K market before it's properly begun? What's more likely to happen is that the big brands concentrate on high-end TVs, as they're already doing to some extent. Walk into John Lewis and you'll see 65-inch and 55-inch 4K TVs from Samsung – both curved and flat – that cost north of £2,300. How long they can get away with that kind of pricing depends on China. The logical step is to focus on developing exclusive OLED TVs with 4K resolutions, which aren't going to be made in China or Taiwan anytime soon. LG and Sony have shown-off such things at trade shows in recent years. In fact, Panasonic thinks OLED and 4K intrinsically go together. But there's a problem. Although OLED has a vastly superior image than LCD – the latter looks very blurry in a side-by-side comparison – it's proving very difficult to reliably manufacture. At the start of this year, DisplaySearch ranged-down its prediction for OLED TVs in 2014 from 250,000 to just 100,000 units globally because efficient production of working OLED TVs is proving very difficult. It all means that 4K OLED TVs will remain scarce and have astronomical price tags. That's not stopped IHS predicting that OLED TVs will sell 8.1 million units by 2018, and one big brand may be on the verge of cracking it. At the International CES in January, LG announced 65-inch and 77-inch OLED TVs, with the highlight a 77-inch curved 4K OLED TV slated for sale this summer. If LG has solved the problems with OLED TV production efficiency (and it's a big 'if') then it could begin to take the challenge to China by producing Ultra HD TVs that look 10 times better than any Chinese attempts. LG's 77-inch curved 4K OLED TV: a bit too big? However, if no-one can deliver 4K OLED TVs quickly and relatively cheaply, brands must look elsewhere for something different to beat-off Chinese competition. The most obvious one is through curved designs, which are exclusive to the big brands. LG and Samsung both have curved and bendable TVs of various types, while there's even been a TV prototype from Samsung that claims a 5k resolution. We could even begin to see efforts at so-called Super Hi-Vision 8k TVs emerge beyond prototype. Most of those innovations are still around the corner; how the big brands battle cheap – and very basic quality – Chinese imports is an immediate question, and the answer could be picture quality. An almost unheard-of concept on UK high street is that of the high-end 4K LCD TV, which can include High Dynamic Range colour palettes, 10-bit colour, faster refresh rates, and even high frame rates. In this regard only Panasonic has got it right, choosing to trail its due-in-Autumn AX800 Series of 4K TVs with promises of THX 4K-certification, DCI studio-grade colour, a 2400Hz backlight scanning mode, and Studio Master Drive processing. All of which make cheap Chinese attempts at 4K TV look second-rate. However, the other brands are so far ignoring all of that, choosing to trail only the detail levels and smart TV antics of their flagship sets. It's dangerously basic messaging that could make cheaper 4K TVs from China much more appealing.